Whole bell peppers are not the most convenient shape when you need to end up with thin, even slices of pepper. It is bulbous and hollow inside, with a narrow core, bits of seeds, and connective membranes. The challenge in cutting a bell pepper is turning this roundish fruit into nice, straight, flat, and consistent pieces, without wasting too much produce. 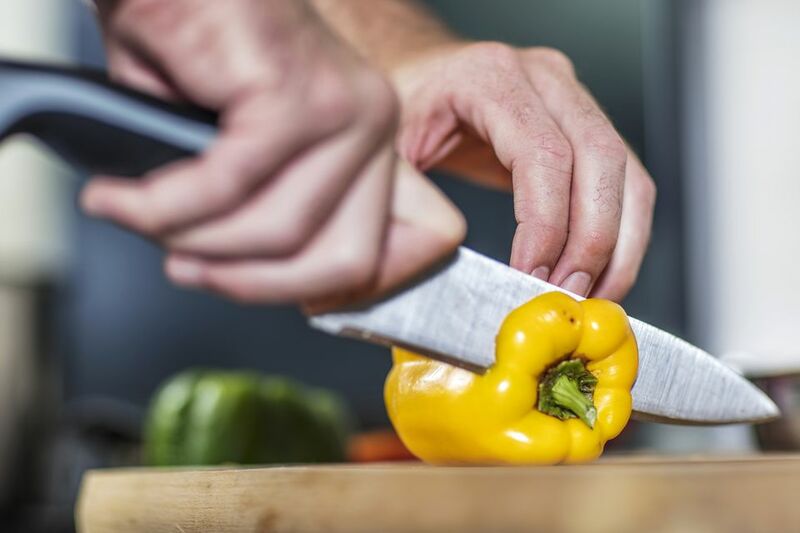 Before you begin, make sure you have a cutting board and a sharp knife, and that you know how to use a chef's knife and you're familiar with the basic grips. Once you are ready to get started, place the pepper on its side on the cutting board and evenly trim off the bottom end. This way, the pepper will stand up straight. If you're making knife cuts that need to be nice and straight (such as a batonnet), the bottom and top pieces will be hard to manipulate into your desired shape. So you will need to cut off the top of the pepper. You can toss it, snack on it, compost it, or dice it and use in another recipe. Looking down into the interior of the pepper, you can see that there are several ribs that attach the pepper's core to its outer shell or hull. The objective is to slice through those ribs, thereby detaching the hull in a single piece, while leaving the outer shell intact. Find a spot anywhere on the edge of the pepper, other than where one of the ribs meets the outer shell, and position the tip of your knife there. Make a single cut from the top of the pepper to the bottom. This step is the tricky part. A sharp knife makes this easier because you'll barely have to apply any pressure at all. As if you are unrolling the pepper, sweep the blade sideways along the inside of the flesh through the ribs. As you do this, the entire pepper should just unfurl itself on the cutting board. If you're not totally confident in your knife skills, don't worry. Place the pepper back on its bottom (as in step 4) and just cut out the individual panels (the wide square sections separated by the ribs) by making a series of straight downward cuts. The pepper won't be in one single piece when you're done, but more importantly, your hands and fingers will be. If cut correctly, the core and all the seeds should come out all in one piece. Discard or compost them. You can unroll the pepper so that it sits flat on the cutting board. Then trim out the little white membranes. Now that you've transformed that weird bulbous fruit into a nice straight flat shape, you're ready to slice and dice it any way you like.